The first burial in what was later Royal Oak Township was on the Russell Farm at 11 Mile Road and Main Street, in 1825. A year later, Daniel Burrows donated about 6 acres in the triangle of what are now Crooks Road, Rochester Road and Main Street, and the 4 or 5 early burials were probably moved to the new cemetery, in 1826. 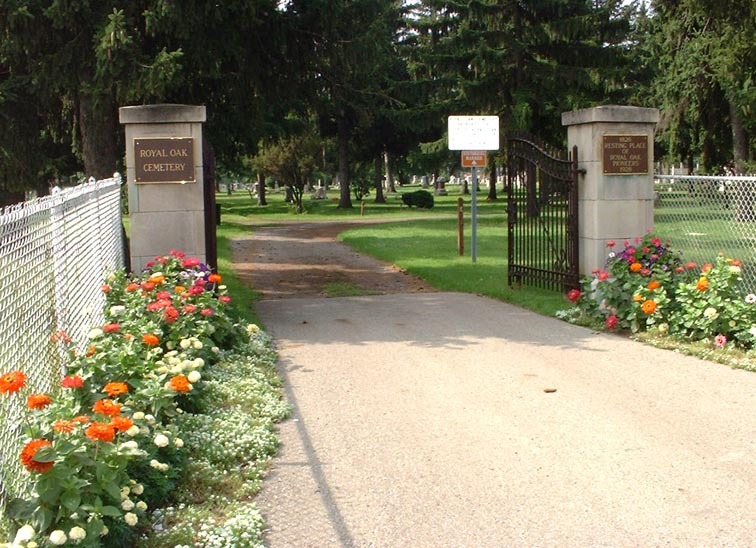 This burial ground was officially taken over by the Royal Oak Township in 1857. Several years later, more land was acquired and in 1874 two acres were sold to the Catholic Society of St. Mary's Parish (St. Mary Cemetery). The map shows the organization of the Royal Oak Cemetery into Sections A-K. In general, the oldest burials are in Section K in the northwest corner at Main and 12 Mile Road, although several old burials are scattered through Sections C, G, H, I and J. The variety of monuments reflects the ego of the individual, love of family or friends, funds available, and the style of monument popular at the time. Some are very ornate, displaying clasped hands, Bibles, weeping trees. Many have verses inscribed, some Biblical, others of unknown source. The older monuments of sandstone or limestone have become badly weathered, some so much so that they are now totally unreadable. Damage has been caused to some by accident and/or by vandalism and many are in need of repair. We hope you enjoy your ramble through this spot of history, now owned and maintained by the City of Royal Oak, and that you will treat it with reverence. You may wish to print out this section and take it with you to the Cemeteries for your tour.